The mathematics teaching major prepares students to teach mathematics at the secondary level. Students complete mathematics courses such as Calculus I, II, and III; Linear Algebra; Discrete Mathematical Structures; College Geometry; Abstract Algebra; Real Analysis; Problem Seminar; either Introductory Statistics with Applications or Mathematical Statistics; and either Differential Equations or Mathematical Models. Students must also meet the requirements of the School of Education to meet professional teaching requirements. The major requires coursework from the Department of Mathematics in our School of Science and Engineering alongside education coursework in partnership with the School of Education. View the courses required for the Mathematics Teaching Major. What experiences will I have? 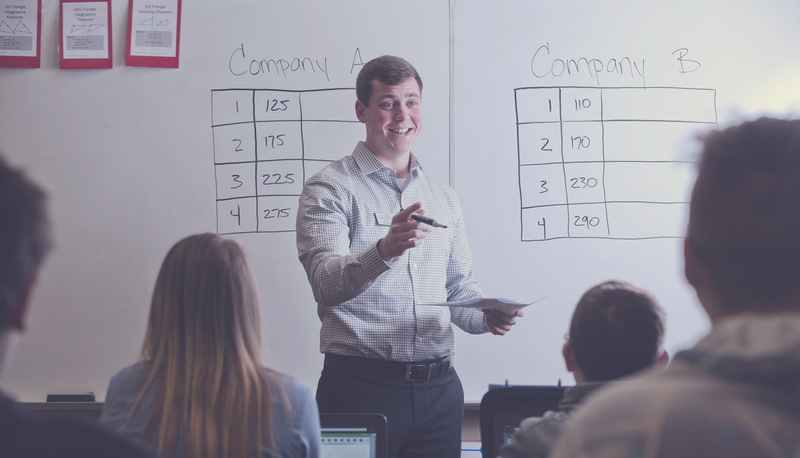 In preparing for careers as mathematics educators, students participate in classroom observations as well as completing a semester of student teaching. Students may also volunteer for organizations like College Mentors for Kids in a variety of capacities that both serve the community and broaden their experience in working with young people.